InterExchange staff and participants enjoy the Brooklyn Botanic Gardens. InterExchange is your J-1 Visa sponsor and source of support during your visit to the U.S. We are a nonprofit organization with more than 40 years of experience dedicated to promoting cultural awareness through a wide range of affordable and exciting work & travel, professional training, internship, au pair, camp, language learning, and volunteer programs within the U.S. and abroad. InterExchange is designated by the U.S. Department of State to sponsor a variety of J-1 Visa Exchange Visitor programs. strengthen the ties which unite us with other nations by demonstrating the educational and cultural interests, developments, and achievements of the people of the United States and other nations, and the contributions being made toward a peaceful and more fruitful life for people throughout the world. promote international cooperation for educational and cultural advancement and thus assist in the development of friendly, sympathetic, and peaceful relations between the United States and the other countries of the world. Our Career Training USA program assists international students and young professionals with J-1 Visa sponsorship for internships and practical training programs they have already secured in the U.S. International students and recent graduates may apply as interns and pursue an internship for up to 12 months in a field related to their academic field of study. International working professionals may apply as trainees and pursue training programs for up to 18 months in a field related to their occupational background. To be eligible, participants’ education and work experience must have been earned outside of the U.S. The primary objectives of our Career Training USA program are to enhance the skills and expertise of exchange visitors in their academic or occupational fields through participation in structured and guided work-based training and internship programs and to improve participants’ knowledge of American techniques, methodologies, and technology. Such training and internship programs are also intended to increase participants’ understanding of American culture and society and to enhance Americans’ knowledge of foreign cultures and skills through an open exchange of ideas between participants and their American associates. A key goal of the Fulbright-Hays Act is that participants will return to their home countries and share their experiences with their fellow citizens. As a participant in the InterExchange Career Training USA program, you must follow all regulations set forth by the U.S. Department of State as well as the guidelines defined by InterExchange, your J-1 Visa sponsor. During your program, we encourage you to take advantage of the cultural opportunities offered by your local host community. During your program and after the successful completion of your program, we’ll ask you to provide feedback in an evaluation about your experience to help us improve our services. Please take the time to submit this information, as it’s required for your participation. Au Pair USA is a 12-month program that gives young people, ages 18 to 26, the opportunity to experience the U.S. by living with an American host family and providing childcare. In return for their services, au pairs receive room, board, a weekly stipend, accident and sickness insurance, airfare and a mandatory allowance to use toward college-level educational courses. This program can be extended for an additional six, nine, or 12 months after successfully completing the original 12-month program. Camp USA places international participants, ages 18 and up, in U.S. summer camps as counselors or support staff. InterExchange also sponsors visas for returning staff or for participants who have found their own camp positions. The Camp Counselor J-1 Visa is a four-month visa. The InterExchange Camp USA program runs between May 1 and October 15 during the program year. Work & Travel USA is a J-1 Visa program offering international university students, ages 18 to 28, the opportunity to live and work in the U.S. for up to four months during their summer vacation. Students work in hotels, inns, amusement parks, national parks, retail stores, and ski resorts. They receive a wage, assistance with housing, accident and sickness insurance, program support, and an optional month for travel to explore the United States. Work & Travel USA also offers a 12-month program for citizens of Australia and New Zealand. Working Abroad enables U.S. citizens, ages 18 to 30, to experience diverse work experiences overseas. Opportunities include Au Pair, English language instruction, work and volunteer abroad placements. We offer programs in Australia, Africa, Asia, South America, and various European countries. 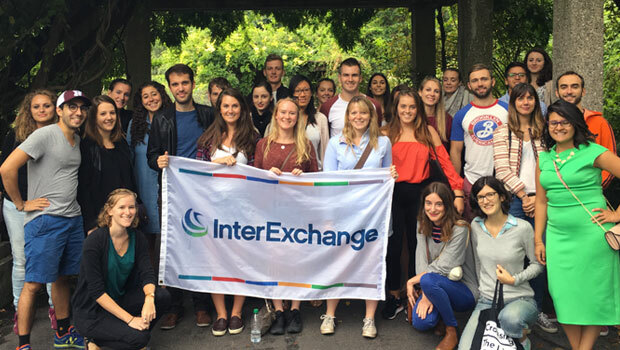 The InterExchange Foundation was established in 2007 to provide grants to motivated young Americans who want to contribute to worthy work or volunteer abroad opportunities. The Working Abroad Grant supports participants of select InterExchange Working Abroad programs and the Christianson Grant supports individuals who have sought out and arranged their own work abroad programs. Many students study abroad every year, but far fewer take advantage of the opportunity to work, intern, or volunteer overseas. By providing financial assistance to talented candidates, we encourage young Americans to discover and contribute to the world and benefit from the unique and enriching insights one can only gain from living and working abroad.